This week's challenge is "Something Old, Something New and Something Blue". This one was supah fun! I even tried a ribbon trick that I have wanted to give a go...handmade ruffled ribbon...very easy and fun to do...I did a mini tutorial very quickly to add to this post...hope you give it a try because you can save money while you use up your stash :) I know I will definitely be making more. Patterned Paper: Daisy D's Autumn collection 2007 - my something "old"
Stamps: Unity KOTM June 2011 - my something "new"
Inks: Memento Tuxedo Black (Tsukineko); Distress Ink Peeled Paint, Broken China, Tumbled Glass -my something "blue"
You will start to be able to gather and scrunch it nicely and easily by isolating a single strand to pull. 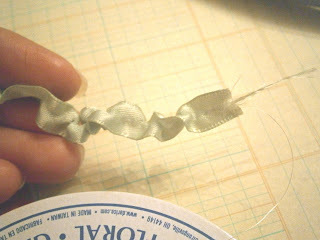 One important thing I found was to leave the ribbon on the roll until you have the length desired. 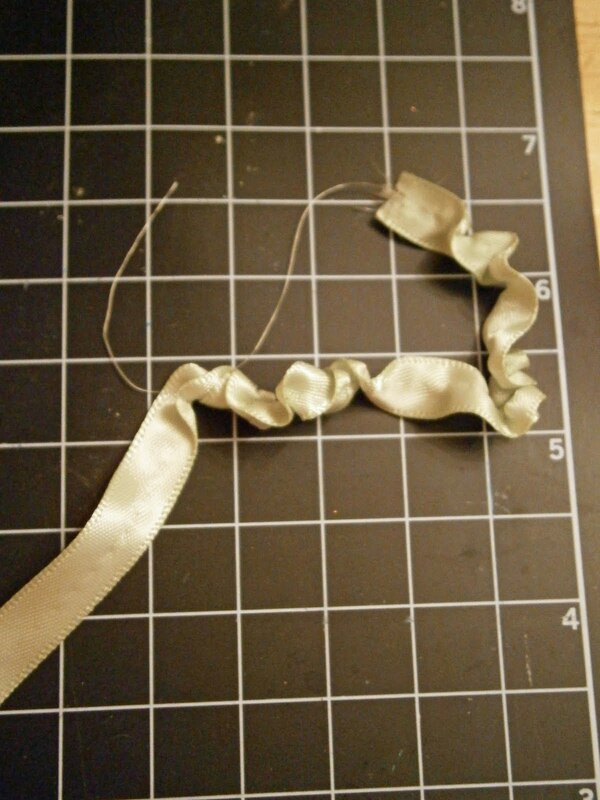 You can actually pull the strand you isolated completely out of the ribbon if using a single piece...talk about frustrating ;) Look how lovely your ruffle looks! 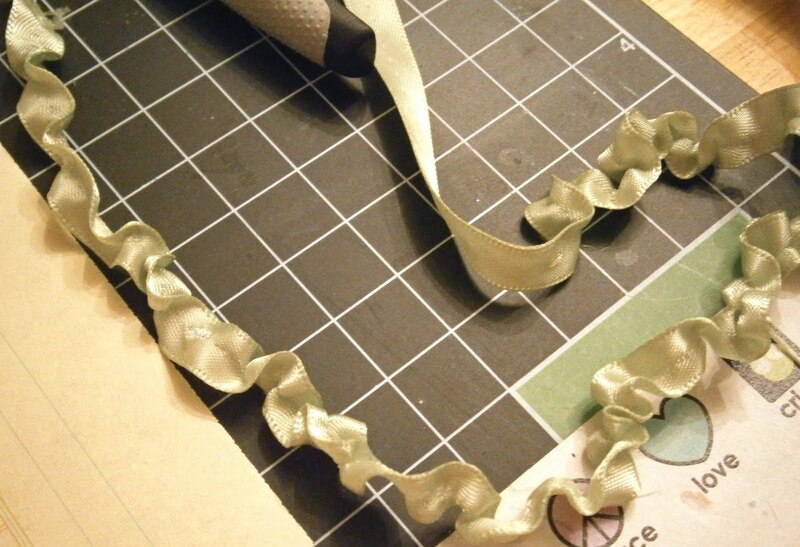 Next, you want to use a strong adhesive to lay your newly ruffled ribbon on your project. I chose double sided tape because I seem to have went through a buying phase at some point and have too much :) You can adjust your ruffles as needed....hee hee! 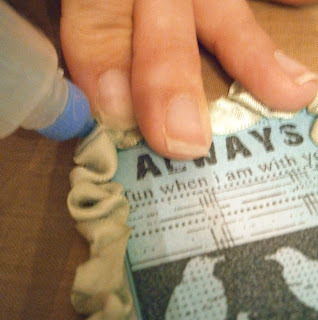 Finally, you want to secure the spot where your ribbon meets...I used liquid glue in the photo, but I didn't like waiting for it to dry, so I hid a mini staple with my Tim Holtz attacher. 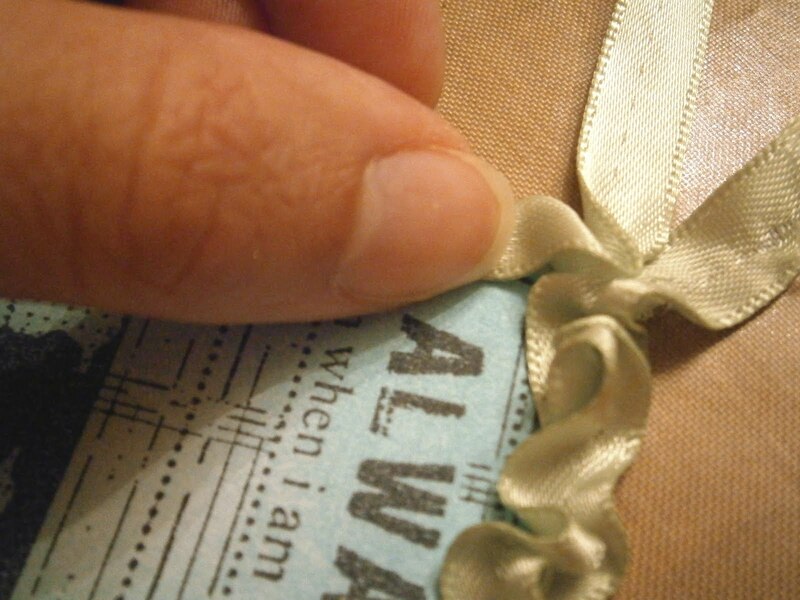 perfect :) You could also cover this with some type of embellishment too. Just a quick tutorial, but hopefully you get the gist. YOU MUST TRY THIS!!! I promise that you will LOVE the look!!!! Ah! I've only ever seen this look achieved with sewing, and I really don't feel like breaking out the kit when I'm already surrounded with my crafty mess! Thanks so much for this tut! First off, gorgeous card! Love the stamp. Second, fabulous tutorial. Really love the simple hints that you miss, hear it, and go AHA!!! Why didn't I think of that!! Thanks!! I love your card! And you just saved me sooooo much frustration! Everytime I've done this the threads would pull all the way out. Amazing tip!! 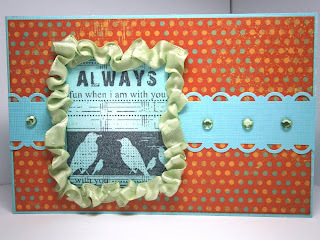 Fabulous card Pryn, great sentiment :) Thanks for the great tutorial too. Gorgeous card!! I love the ruffled frame you made with the ribbon! I have not tried to ruffle ribbon this way but will now! Thank you for the tutorial! I hope your computer troubles are over! FANTASTIC idea! I will be doing this with some ribbon. THANK YOU for stopping by my blog because now I popped over to YOUR blog in 1 click :) hee hee hee. Hope all is wonderful with you. I'm always around...just need to nudge me every now and then to wake me up! LOL HUGS to you GF! 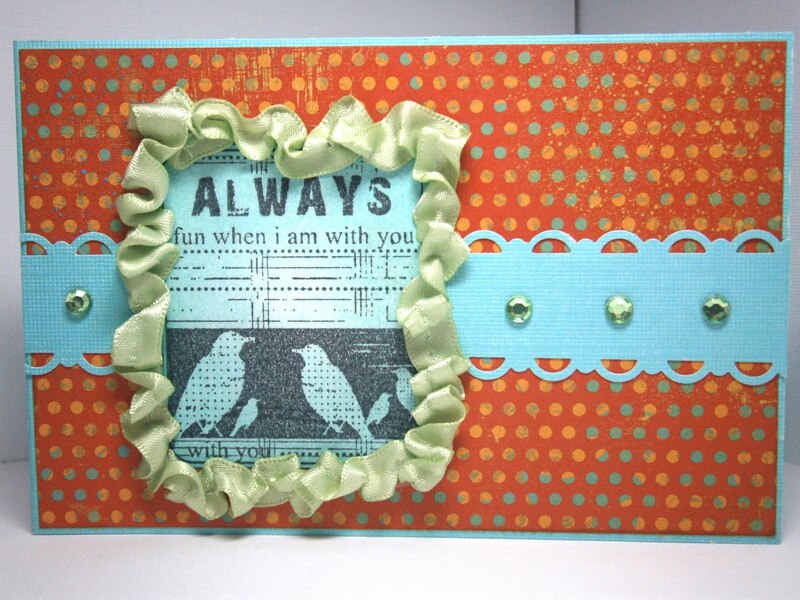 Gorgeous card Pryn...and great tip for the ribbon! Nothing worse than getting it just how you want and then pulling the silly thread right out...grrrr LOVE how you made a frame with it, it looks amazing. Oh, this is so fun Pryn! Love the card (especially that image), and the tutorial! 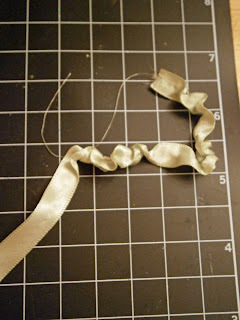 I tried ruffling my own ribbon once, but it didn't look as pretty as yours! Gorgeous and love the tutorial! TFS! Hi. Just checking out your card with the single ruffled 'flower' on Outlawz, Pryn & found this instead but reckon it must be done similarly. Fab job explaining it too. I thought the ruffling was always sewn. Beautiful embellishment & thanks for the inspiration.